Below are Box Office Collection Report of bollywood film 'Toilet Ek Prem Katha' With his review, budget and total China box office and worldwide collection status. Toilet Ek Prem Katha movie lead star cast is Akshay Kumar, Bhumi Pednekar. Toilet Ek Prem Katha is an indian Social, Comedy, Drama Film of 2017, directed by Shree Narayan Singh & produced by Akshay Kumar, Neeraj Pandey. The film has been released on 11,500 screens in China. Where Salman Khan's Bajrangi Bhaijaan was released the highest .. 8000 screens. On the other hand, Baahubali 2 and Dangal 7000 on the screen .. while the Secret Superstar was also released on 6000 screens. 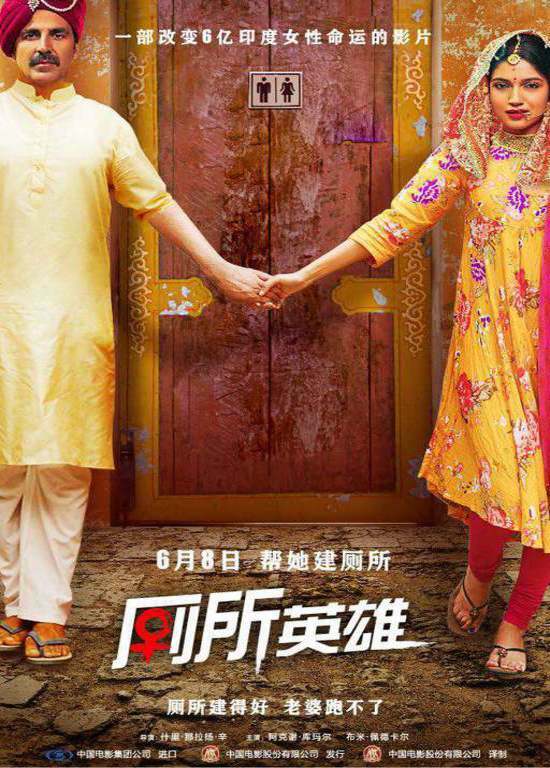 Toilet Ek Prem Katha opens in China larger release than Seceret Secret SuperStar, Hindi Medium and Bajrangi Bhaijaan.